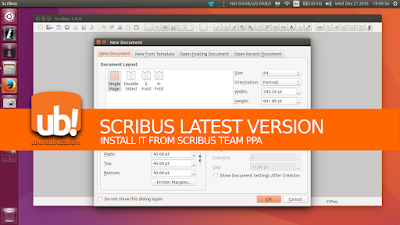 If you want to help testing Scribus, if you want the newest Scribus version, if you want Scribus development version ("bleeding edge"), whatever the reason is, you can do it in Ubuntu by using Scribus Team PPA. You setup the PPA source in your system, install a version of Scribus from that PPA, and then use that Scribus version. This PPA is currently available for Ubuntu versions 14.04, 15.10, 16.04, 16.10, and 17.04. SCRIBUS FILES ARE NOT BACKWARDS COMPATIBLE!! The package name scribus is the Scribus software in 1.4.x versions; the scribus-ng is 1.5.x; the scribus-trunk is the most latest version produced daily from source code. You may want one of these three names to install. Open your Terminal and perform these three command lines one by one.